Just because you make it, doesn’t mean they’re going to buy it. 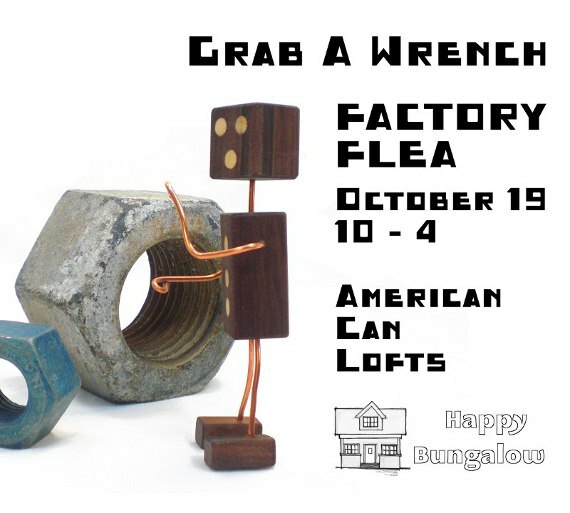 Say like you make 300 and some odd little toy train accessory buildings for your first craft show (that’s modestly attended by the way). Let’s say you make all these buildings. Not everyone wants to buy them. You can worry all you want that you’re not bringing enough product, but there’s no need to. YOU WON’T RUN OUT. Ok. 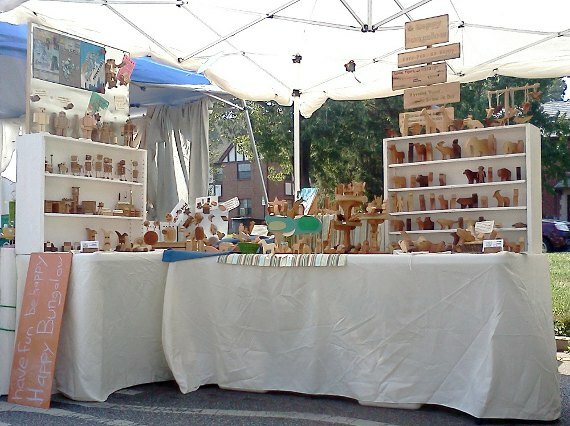 I didn’t expect to sell 300 little buildings at my first [small] craft show, but there was like 12 different kinds of buildings, so there’s only 20 of each type . . .
We’ve had big runs on one items at shows before. You know, big shows in the Fall when people can’t buy enough cool toys. 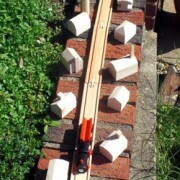 The train buildings were one of the first Happy Bungalow toys. The thinking was: everyone sells those little toy train track and magnetic trains, but accessories are hard to find. And if you can find any buildings, they’re always painted. How about some plain and simple accessory buildings? Guaranteed to sell right? We identified a product missing in the marketplace. A NEED that all those business books always talk about. 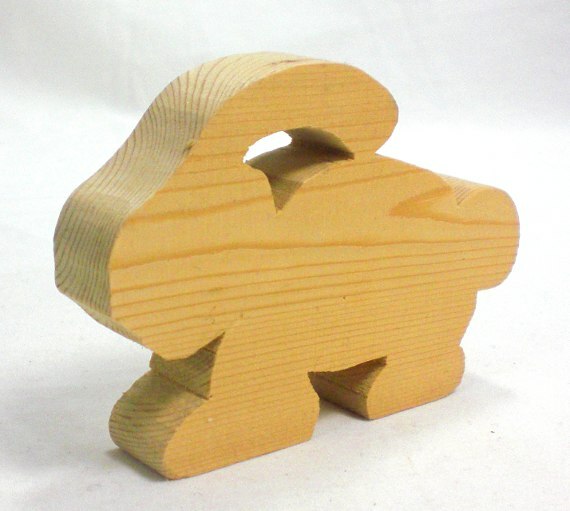 Being one of our first toy lines, it took a while to figure out just how to cut the wood safely. 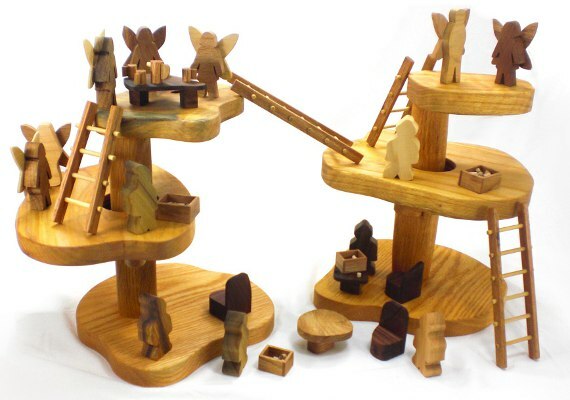 The saws in our shop cut fingers just as easily as they cut wood – and these toys are so small – and if you don’t/can’t hold the wood firmly in place it will fly away from the machine at high speed. So once we figured out the techniques and process we maximized our tool setup overhead and ran off a few hundred buildings. 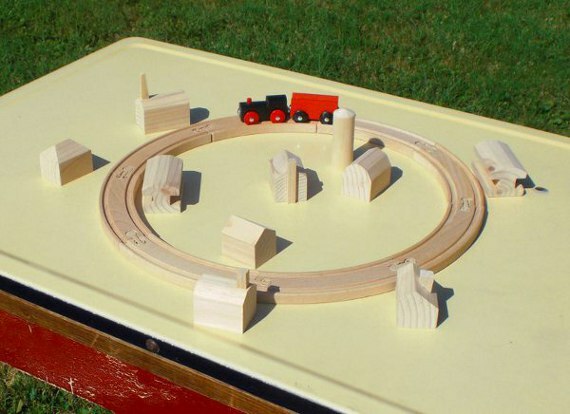 For our first show we put together a train demo display on the ground for the kids to play with (see below). Then on the table above we lined up a few dozen of the buildings. 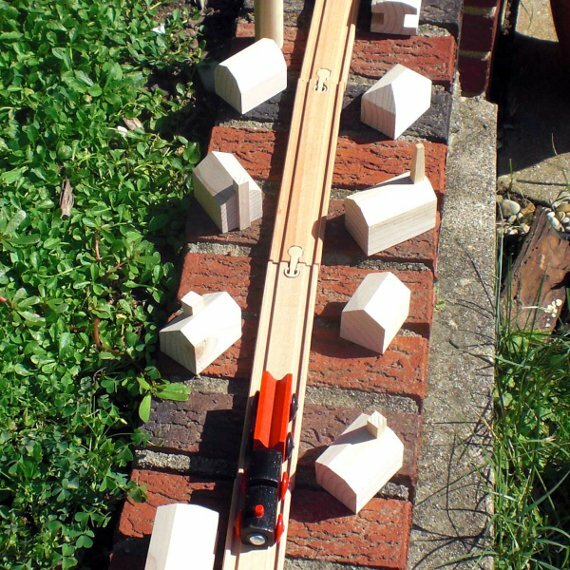 We really fussed over the best train layout too. Probably went through a half dozen configurations beforehand (don’t miss those days). So it was a lot of work, you follow? And did it pay off? Did it pay off?! The NUMBER ONE product people wanted to buy that day? This was the first and only show the train and tracks were ever displayed at. The buildings come to shows from time to time, and they do well enough. Though we still have a box full of the suckers. For all the fussing about the layout we did come up with a cool idea for the table toppers – using a sort of butcher paper that we wrote little product descriptions and prices on. A note about the first two pictures. They were part of our first photo shoot. We drug furniture, ladders, props, and back drops out into the back yard. Spent and afternoon shooting hundreds of pictures and another afternoon editing them. Eek. Read the rest of our Throw Back Thursday series here. Last time on Throw Back Thursday . 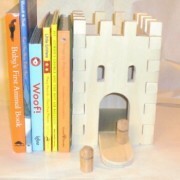 . .
We dug up an early prototype of a castle bookend. Well, here’s the computer model that preceded it. Pretty neat looking, and probably pretty fun too, but none of them ever made it into production (read more about why in the original post). I’ll ramble on a bit about computer models and prototyping. We do all of our 3-D models in Sketchup. It’s a free program that is super-handy, and relatively easy to learn. I’m not the best self-taught computer person, but I figured out the basics of Sketchup in a day or so. A few projects later and I was competent enough to do interior architectural models (I wasn’t always a toy-maker you know). 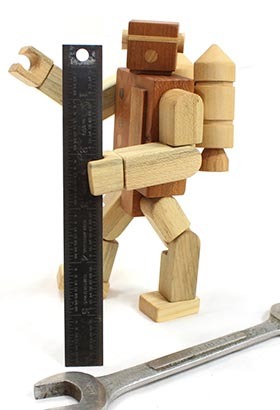 With computer models you can know exact dimensions, work out potential problems, and generate cut lists (how many and how long of pieces of wood you’ll need). Though, I like to work on the fly, working from simple sketches and physical protoypes (see an example in a post about toy car design and a bit about toy car construction). So we don’t produce too many digital models anymore. I will say though, if we were working on any sizable pieces, we would turn first to a computer model. You can see in the built prototype that most everything is the same as the digital model. The little dowel people were simplified and the upper windows were more real, but the physical castle was the same. I probably went through 5 different hinge types for the little draw bridge. That was tricky. The Kids ended up with the castle prototypes, there’s a half dozen of them. So we would hook all the individual wall pieces together (nothing was glued) and make super giant castles. Never a roof though. Inside the castle would sleep cars, princesses, blocks, and whatever else was around. This was in the days when our oldest was figuring out how to go to sleep in a big kid bed by herself, so a lot of play time was devoted to putting her toys to sleep. Liz and I don’t miss those battles of getting the two year old to go to sleep at night, but we sure do miss that play-time. In case you’re wondering, we have discovered the secret to getting little kids to sleep at night – give them a sibling to sleep in the same room with. In recognition of Throwback Thursday we post this old prototype. 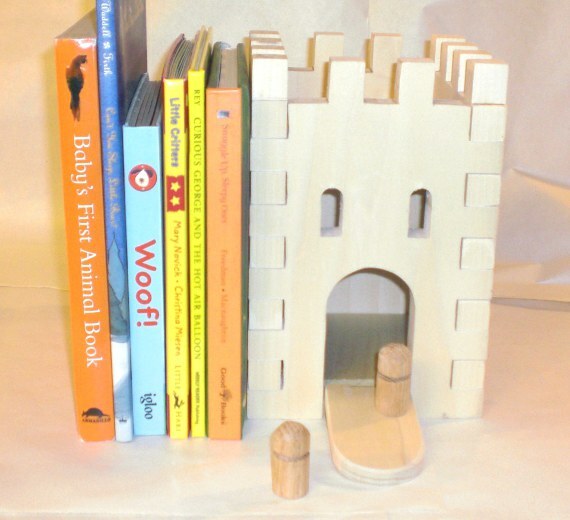 It’s one of about a dozen attempts at creating castle themed bookends. I never figured out how to make them to the level of quality we strive for, and for the price we thought they could sell at. 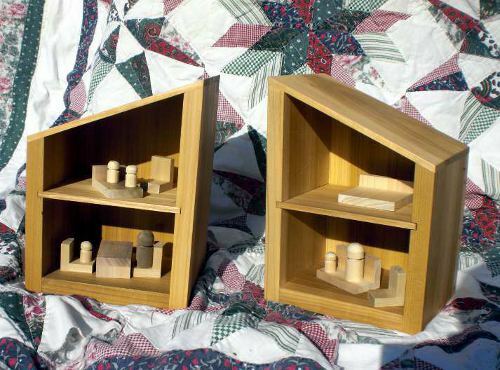 The idea was for the bookends to be playable toys, outfitted with simple dowel people (much like the little peg people you see everywhere). Perhaps we need to go back a little further. 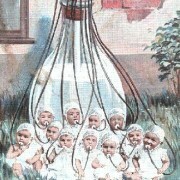 Before Happy Bungalow was Happy Bungalow it was Kiddie Kottages. When Liz and I were first dreaming up this business we were going to create playhouses for children (spurred on by the encouragement of friends, see the playhouse here). We made notes and sketches. We created 3D models of the playhouses. We thought up just the right business name and registered domains (until recently kiddiekottages.com and kiddiecottages.com redirected to happybungalow.com). 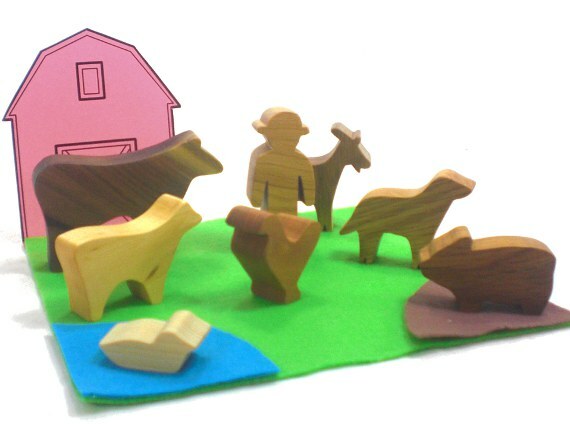 And then we thought up some little products to accompany the playhouses. The idea was that we’d make the playhouses and everything you needed to put in them. So the original Happy Bungalow product line started out as accessories to Kiddie Kottages’ big playhouses. But starting a new business and creating these multi-thousand dollar playhouses was too much, so we focused on the smaller pieces at first with the goal to move on to playhouses later. We’ve pretty much given up on the playhouses for the immediate future, but some of those original products still hang on (our wooden animal toys being the most notable). 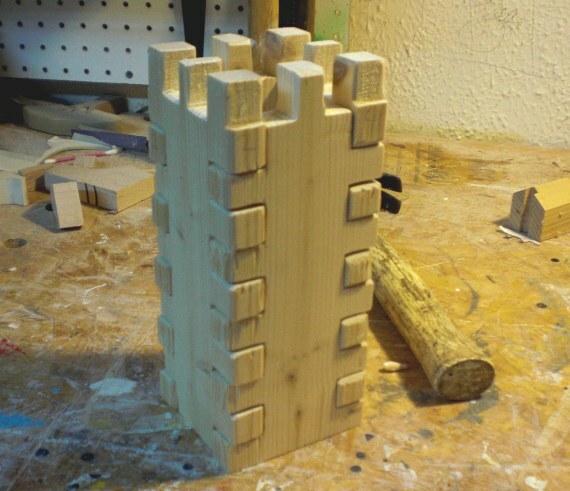 Much like the never realized castle bookends, the dollhouse bookends below went through extensive prototyping (and before that digital models you can read about here), but end the end it was hard to find a workable price-point for them. It was also difficult to generate the level of quality (again at workable price point). 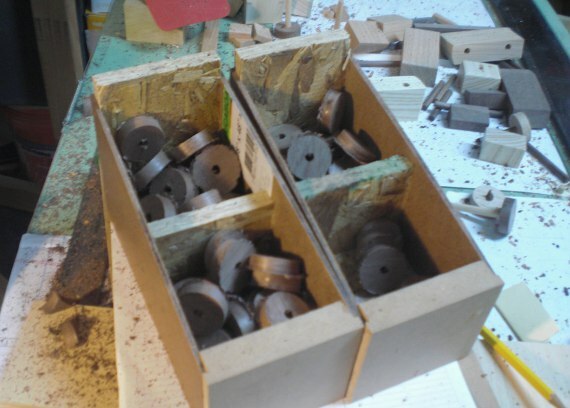 Though the shop has expanded its tooling, we might take another attempt at it. 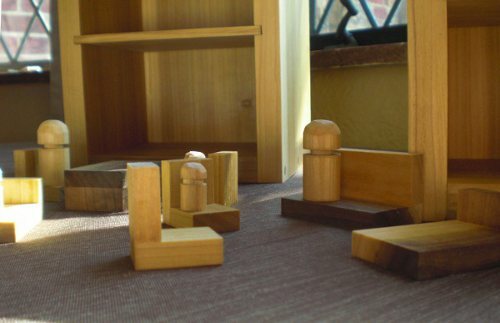 The simple little furniture did prompt a friend to ask if I could make some furniture for her daughter’s inherited dollhouse. 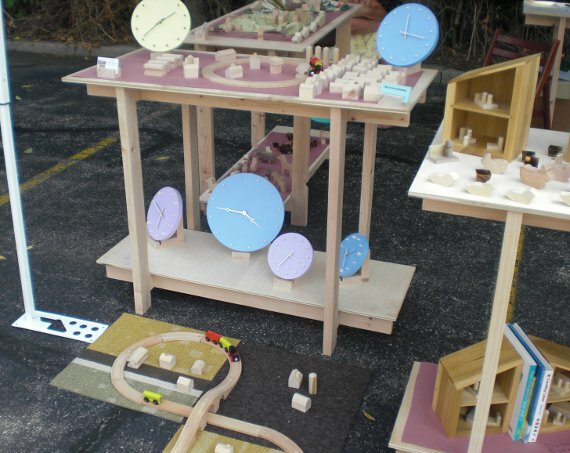 Well, that is a product line that has done quite well (read more dollhouse furniture posts here). 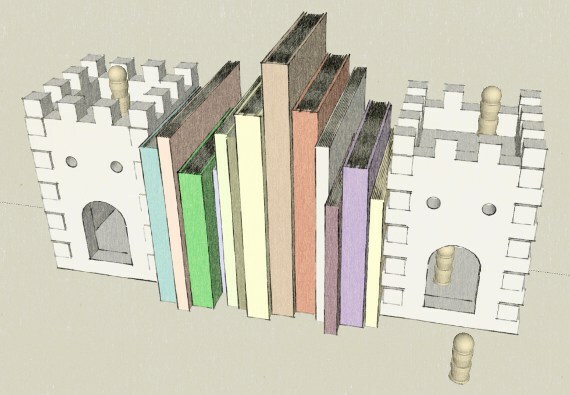 So in the end the castle bookends never made it into production. The corner joints (box joints) were the problem. I was attempting to create a faux quoining (fancy architecture word for those stones that stick out on the corner of buildings). Perhaps one of these days . . .
We’ve been making a lot of stars lately. 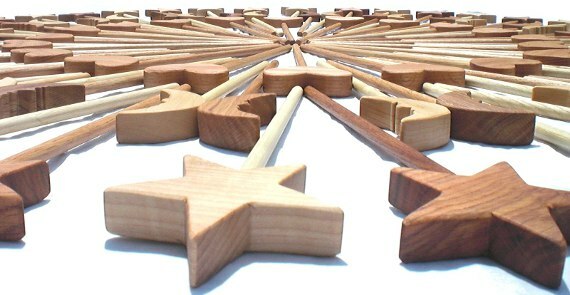 Hundreds and hundreds of stars; which is awesome because someone is paying us to make stuff! How much cooler of a job can you have? But, as we’re making hundreds at a time, it’s best to be efficient at it. Except there’s no calculator in the shop – only old fashioned long-hand math. 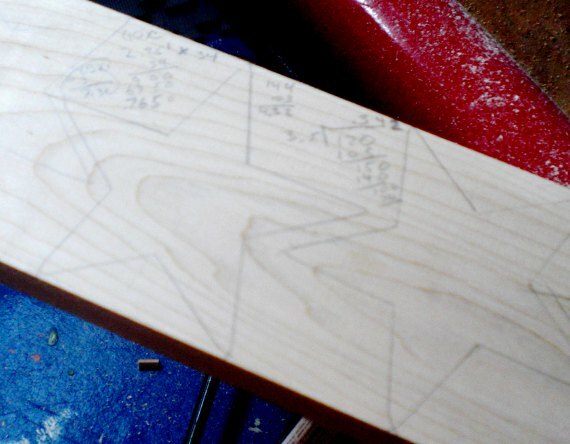 I also figured up how many square inches of wood each star used – this told me my raw materiel cost for each piece. So yes, math is important. I don’t use calculus in the shop very often, but geometry and algebra are very important. Kids! Pay attention in math class! Don’t end up being the person that needs a calculator to double check his 7 + 7 math. Well, I am good at math, I think it’s fun – like solving a puzzle – but surprisingly to most people great math skills aren’t essential to architecture. Basic geometry and a little algebra is all you really need to be competent. A high-schooler would be able to handle most of the math work. So what’s the number one skill essential to being an architect? Working an unspeakable number of thankless (and unpaid) hours. As a toy-maker at Happy Bungalow I work more hours, but they are the opposite of thankless. I have fun every day, almost without pause. I mean come on! We’re making toys here. My job is to make toys! 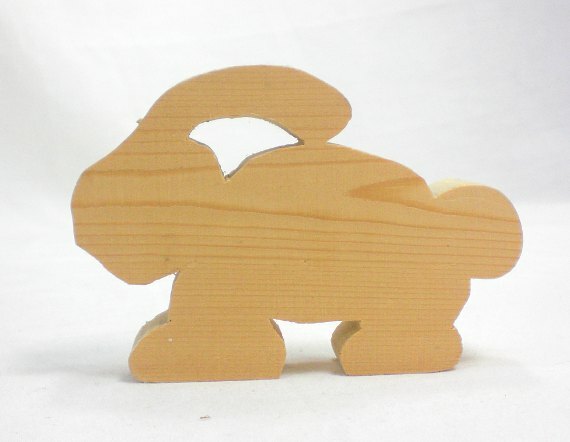 Stop into our online toy shop to take home some of our work. 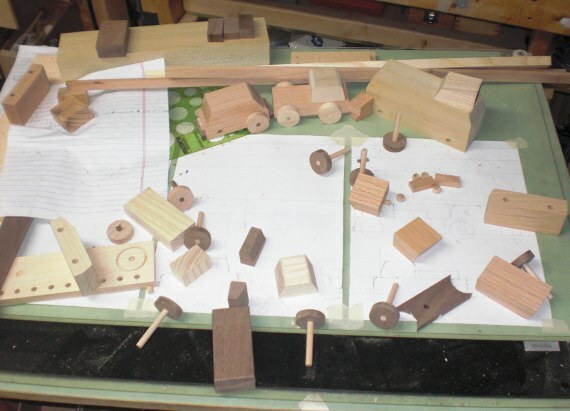 New wood cars are being designed and constructed here at the Bungalow. These prototypes are taped together, unfinished, and in need of sanding – but this hasn’t dulled a certain household member’s excitement. Finally we have made a fire truck! Fire truck! Fire truck! Along with a semi-truck, taxi, dragster, fuel truck, mini-car, and bus we’ve amassed enough vehicles to put together a Car of the Month Club. We’re envisioning this Car of the Month Club to be something like a jelly of the month club, except much lower in sugar and much higher in fiber*. As rated by the Kids, the favorite new vehicle is (hands down) the fire truck. The semi-truck is a close second though. We’ll be working on a few interchangeable trailers soon. 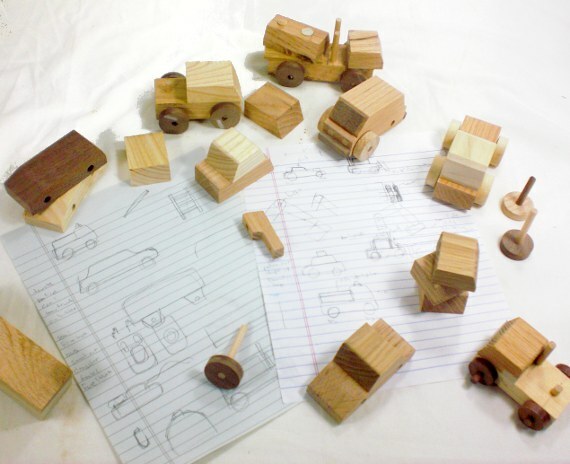 While these trucks aren’t yet available for purchase we have some other great wooden cars in our shop. Well, I don’t know just how many steps there are, but I bet I’m close. We make our toy cars and trucks like any other toy we make: Quizzing The Kids about what they’d like to see in a new toy. 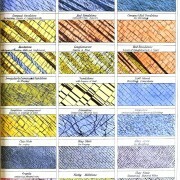 Then come some sketches which they usually don’t understand, but are enthusiastic to support. Next comes some hand-drafted drawings (see picture below) and the first round of prototypes which The Kids understand well. This feedback really helps to inflate my ego and solidify my position as Most Awesome Dad. I play with The Kids, see what other toys are invited to play with the new group, and keep an eye out for rough play that might reveal weaknesses. Then I take the toys back to the shop for simulated play and abusive testing. Weaknesses are corrected and the design/look of the toy is usually tweaked. Then it’s on to figuring out how I’m going to build these things. It’s one thing to build a one off toy for the fun of it, it’s another thing to make quality toys for a price people are willing to pay. It’s a long process and quickly drifts into the weeds of specifics . . .
. . . so we’ll shorten it up a bit . 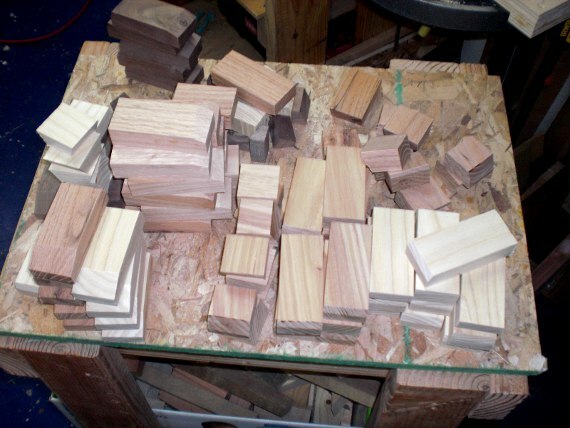 . . a stack of wood is planed, cut, sawn, cut, sawn, and cut again. And here at the Bungalow we use hardwoods – not a 2×4 (aka pine, spruce, or fir). These cars are made from red oak, ash, walnut, and hickory. Tough enough to be played with by three year old boys and strong enough to survive a random gnawing by a little brother. 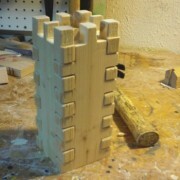 Once all the piece are cut, they’re neatly stacked (see above). All the cars have a base and a top, are the same width, mostly the same length, and are all cut with complementary angles. Every car gets two holes drilled for axles (see below) and one small hole on the bottom where the tow truck can hook onto. 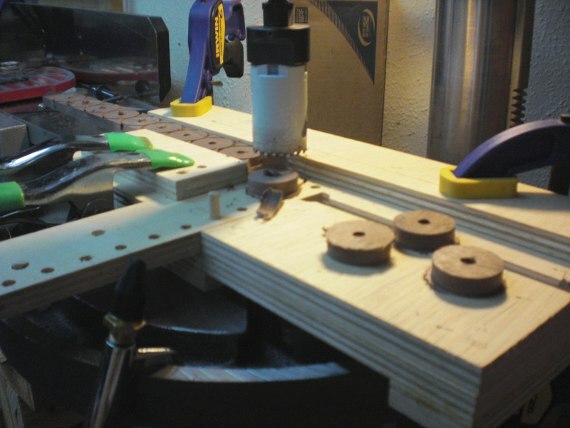 I use a custom-made adjustable jig for all the drilling. This operations piles up the saw dust – I depend on my compressed air hose to keep the work-surface clear. I drill and drill and drill and drill. 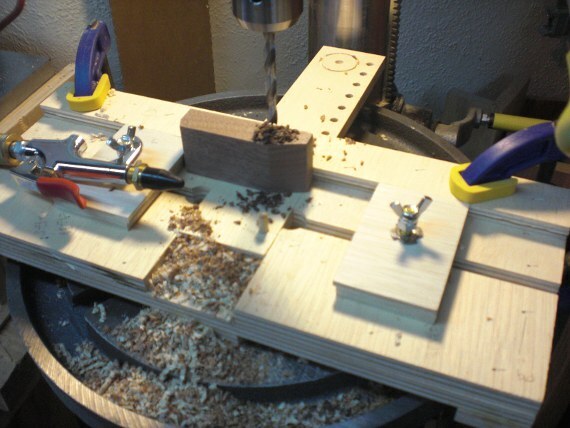 You might think drilling holes for an hour or more is boring – but you’re wrong. I get to sit on a stool while I do it. It’s hard to be bored in the shop when you’re feet are happy. All Happy Bungalow cars are equipped with Strong Ox tires, mfg. Cincinnati, Ohio. They’re cut with a special hole saw. 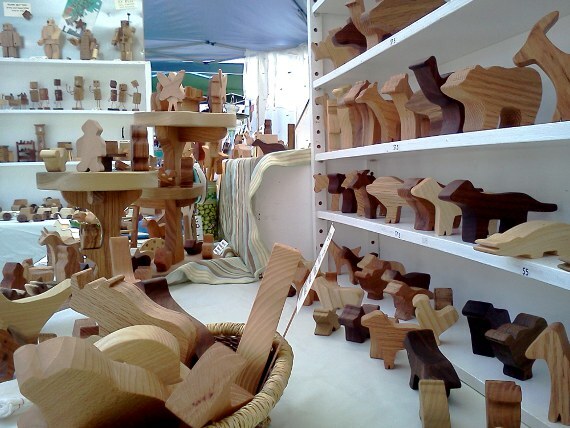 The wheels are made from walnut, unlike most wood toy cars you see which are made from a lighter toned wood (maple or beech) and look suspiciously similar. Our axles are cut from walnut dowels. By now there’s a stack of car parts that need gluing, sanding, gluing, sanding, sanding, a smidge more sanding, and finally some natural wax finishing. I use power sanders, but a lot of the sanding work is done by hand. 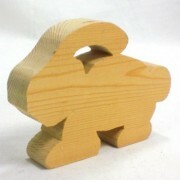 All corners are smoothed over – no sharp edges are left to pester little hands. I cringe to say this, because it sounds like some lame marketing line, but I do pride myself on craftsmanship. Well made, well detailed, and finely finished. See the end results here. And take home your own car from our shop here.